AdCraft Full Size Food Warmer 120V 9.25" H x 14.5" W x 22.5 D. Full size food warmer is constructed with a stainless steel housing for excellent durability. The interior well is constructed of 20 ga 18/8 stainless steel with a 10" x 20" opening that is 6.5" deep to accommodate all standard size food pans up to 4" deep. The dual element design provides efficient and even heat distribution. 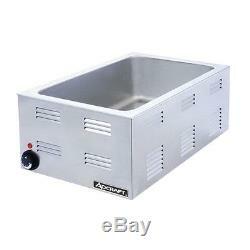 This item maintains food temperature at HAACP standards of 140-145F degrees. It is easy to clean and has a manual temperature control knob. The overall dimensions are 9.25" Height x 14.5" Width x 22.5 Depth, 120V, 1200W, 10 Amps. 5' power cord with a NEMA 5-15 plug. 22.5 x 14.5 x 9.25. Constructed of heavy stainless steel housing for excellent durability. Interior lining made out of 20 gauge 18/8 stainless steel. Maintains food temperatures in excess of 140 degrees (the requirement for safe food service). The exterior dimensions are 22.5"L x 14.5"W x 9.25"H and the interior dimensions are 20"L x 12"W x 6.5"H. Fits standard size steam table pans. Check out my other items. The item "AdCraft Full Size Food Warmer 120V 9.25 H x 14.5 W x 22.5 D" is in sale since Friday, January 6, 2017. This item is in the category "Business & Industrial\Restaurant & Food Service\Commercial Kitchen Equipment\Storage & Handling Equipment\Heating & Holding Cabinets". The seller is "pjpmarketplace" and is located in Philadelphia, Pennsylvania. This item can be shipped to United States.